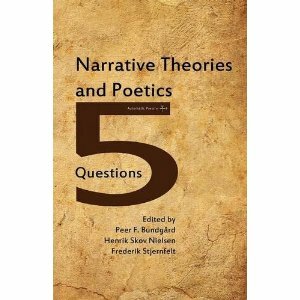 In the present interview book, Narrative Theory and Poetics: 5 Questions, eminent narratologists, literary scholars, poeticians, stylisticians and philosophers answer five simple and broad questions. As is generally the case in the 5 Questions Series, the questions are intended to give the authors an occasion to outline their intellectual biography -- in whatever detail they find necessary, with or without the anecdotes of life -- as well as to lay down their idea of the state of the art of the domain of research to which they have devoted their work including the future challenges and unsolved issues it is still ripe with. The title of this book does not designate any research program as such. Neither does it suggest that all contributors are brothers in arms, gathered under the same two-colored banner. In a case like the present one, titles are meant to be compromises, vague predicates -- as Charles Peirce had it -- which roughly indicate the matter of the contributors' intellectual concern, the kind of thing they interrogate and explore, in different directions, with different purposes and in different theoretical frameworks. In other words, not all contributors are specifically involved in narrative theory or poetics stricto sensu (although most are), but all of them have developed an original theory by examining the nature of an object we could call the literary artwork: stories, poetry, verbal art in general. Nonetheless, if "narrative theory" takes on a prominent position in the title, it is of course because the bulk of this book consists of contributions from scholars engaged in the study of stories. Some of them are outstanding pioneers in this research field -- we could call them 1st generation narratologists -- others have succeeded them by opening new paths, formulating new questions, addressing new issues in the investigation of the stories of humans, what they are, what they do, how they hook up with the human condition, human thinking, acting, cognition and consciousness. As the reader will soon realize, the unity or even identity of the object of investigation -- the story -- does not entail identity or unidimensionality of theoretical approach: scholars are concerned with rather different (but not for that matter mutually exclusive) things while considering the same kind of object. Probably for the simple reason that stories, like other intentional phenomena, are essentially multifarious objects, susceptible of being examined along different theoretical lines, according to the aspect highlighted in a given type of investigation. Just to mention a few of these aspects: stories are transcultural, universally instantiated phenomena (all cultures seem to construct a type of verbal art where non-trivial events, involving sentient beings, are linked in recurrent types of structure); it seems thus natural to ask, as some of the contributors have done (in the wake of the ancients), what exactly stories are, what is their mechanics, their physics, as it were, what do they consist of, even what must they consist of, to what constraints is the unfolding of the plot submitted, and so on? We could call this the ontology of stories. Now, if humans universally display a propensity for story-telling, stories (and verbal art in general) most likely play an essential anthropological function, so another general line of research consists then in answering the question what do stories do, or what do humans do with stories (fictional as well as non-fictional)? What is the cosmological (mythological) use of stories, what is their social function, what is their intersubjective function, and what is their subjective or psychological function (for example in the construction of what is often called the Self)? We could call this vast field of research the pragmatics of stories. Finally, as someone once put it, the words of stories and poems come out of a head, not out of a hat. This simple fact opens a cognitive line of research aiming at examining verbal art with a view to capturing what stories and poems tell us about the human mind, what it is sensitive to, what is significant for it; what are the means by way of which they give access to the consciousness of a character, what are the tools thanks to which they shape whole worlds or small packets of meaning, and what are the crossovers between plain meaning making, or plain cognition, and aesthetic meaning making and cognition (questions which are also highly relevant outside the realm of narrative theory, in poetics and stylistics)? This book, of course, does not tell the whole story, but we do think that -- through its intellectual flash biographies, its theoretical concerns and crash courses in cognitive poetics, the ontology of art, stylistics and narrative theory -- it conveys to the reader a valuable gist of what stories and verbal art in general are, what they do, how they do it and probably also why. Peer F. Bundgaard, (*1967). Ph.D. in General Semiotics 1996. Brian Richardson and Jan Alber. Recent books: "Diagrammatology (Springer, 2007), "Semiotics.